Scarce map of South Central Africa. Scarce map of the Congo, Angola, central Africa, and Monomotapa (Zimbabwe / Malawi) issued in 1732 by Jean-Baptiste Bourguignon d'Anville. 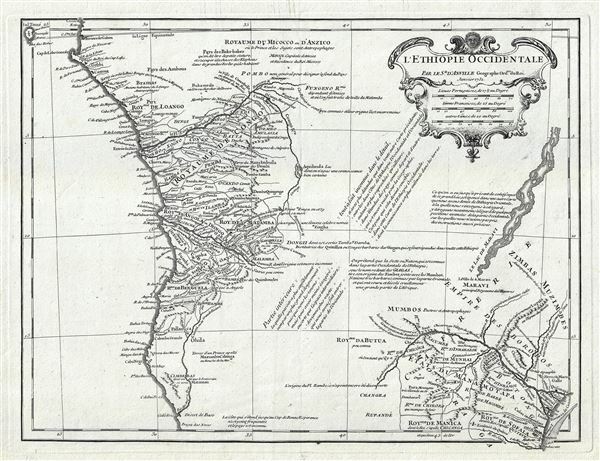 D'Anville's map covers the west coast of Africa roughly from Sao Tome and the Gabon River southwards as far as Gulfo Frio and the Desert de Baso (modern day Namibia), and westwards to the pacific at the mouth of the Zambezi River. This map is exceptionally interesting as it displays, at once, Portuguese activity and discoveries on both sides of Africa: in Angola and the Congo in the west, and in the kingdoms of Monomotapa, Manica, and Sofala on the eastern shores,. Both the Congo and Monomotapa (and the neighboring kingdoms) are relatively well mapped with numerous indigenous groups, trading centers, and river systems identified, however the Portuguese relationship with both regions could not be more different. The Portuguese discovered the Congo first, and though ostensibly on equal terms with the Congolese Kings, in fact treated the region as a subject kingdom and as a source for African Slaves. On the opposite side of the continent, on the other hand, the kingdoms of Monomotapa, while tentatively holding allegiance to the Portuguese King, were in fact largely equal trading partners, supplying Portuguese merchants with gold, ivory, and other treasures from the interior. The vast unexplored territories between these two lands are however particularly striking - most of which D'Anville has filled with copious textual annotation lamenting his lack of reliable reconnaissance. Lake Malawi, here identified as Lake Maravi, is however beautifully mapped extending an unknown distance northwards. Though not formally discovered until 1846, it is one of the few superb examples of indigenous geographic knowledge being successfully translated into accurate cartographic content without direct European observation. Perhaps this map's general scarcity is derived from the fact that by the 1730s Europe had little interest in this region. The slave trade by this time had largely shifted to other centers and was being funneled to the Americas by independent English and American traders. In Monomotapa, the Portuguese discovered the perceived gold wealth of the interior was in fact very limited and maintained only a token presence on the Zambezi. Like most of D'Anville's work this map was in independent issue and included with numerous composite and made-to-order atlases throughout the 18th century. Perhaps, with interest in central Africa at a low ebb, D'Anville customers just weren't buying this map? Very good. Platemark visible. Blank on verso.